Just south of Wells, turn off Rte 30 and drive on Algonquin Road past the dam for 0.7 mile to West River Road. Continue for approximately 8.3 miles on West River Road to a large clearing, where the road ends. The trail starts in the woods, and parallels the river along most of the way. This is a 2.5 hike (one way) over uneven terrain to the West Branch Gorge, and should only be taken mid-summer when the water levels are low. 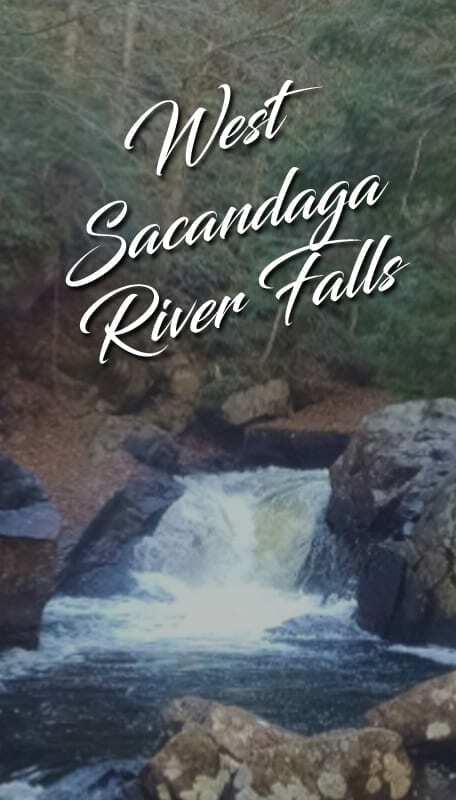 These Falls on the West Branch cascade through a narrow gorge of the West Branch of the Sacandaga River that are over 400 feet tall in spots. From the trailhead, hike approximately .6 miles, where the path takes a left. Follow the path and cross Hamilton Lake Stream at 1.2 miles, which will be difficult in high water. Continue and cross Cold Brook at 1.8/1.9 miles, where you can see Cold Brook Falls upstream. Follow the river on the north bank until you see the first waterfalls (10-12 ft.) on the West Branch at approximately 2.5 miles. The second smaller falls (8 ft) is located several hundred yards up the river from the first, but cannot be seen due to the rough topography of the walls.